→Crowd Content Review: The Best Site for Outsourcing Content? In this Crowd Content review I am going to share you my experiences with their services. My goal is to answer all your questions about Crowd Content, “How much do the articles cost? How much money can you earn as a writer? Are their articles worth? How does Crowd Content work?” and so on. If you have any more questions after reading this article, just leave a question below and I’ll be more than happy to reply you personally. Before we dive into the text, I would like to show you the video review that I recorded about Crowd Content. I know that many people are visual and prefer watching and listening instead of reading. That’s why I think the video will be helpful for many of you. Also, it helps you to understand how their website works. I show how I order the article on Crowd Content. 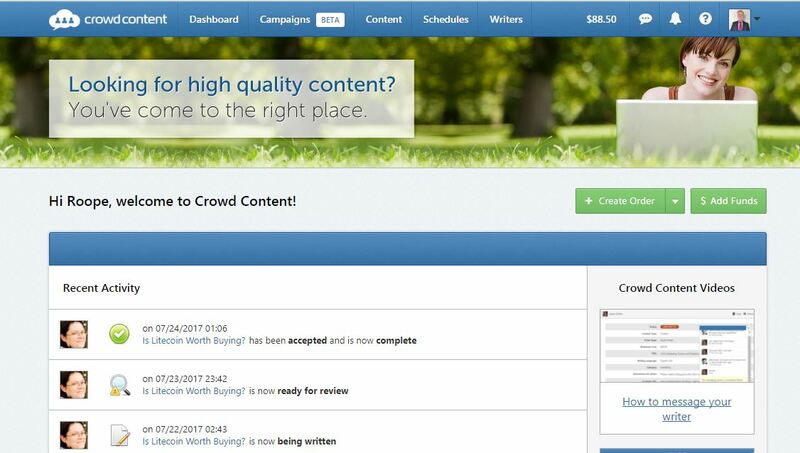 Short Review: Crowd Content is a reliable and a high-quality content creation service. My experience with Crowd Content has been positive and the articles that I ordered are driving tons of traffic to my website. The drawback of CC is that their articles are more expensive than on some other marketplaces like on HireWriters or iWriter. My recommendation is that you try all of these marketplaces yourself and make a decision based on your own experiences and needs. If you want to know how to get from freelance writer to an online business owner, learn more on Wealthy Affiliate. Crowd Content is a content creation service that provides articles for people who need them (like blog/website owners, small business owners, etc.) and an opportunity to earn money for freelance writers. I heard about the Crowd Content first time from the Wealthy Affiliate live coach Jay Neill. So, the company has a pretty good reputation and they are a reliable player in the marketplace. The requirement for writers is that they are native speakers. How Does Crowd Content Work? I already showed the process in the video above so you can check it out if you didn’t. Crowd Content works similarly to any other freelance writer marketplace. This picture is from iWriter but CC works in the same way. 5-Step Process to Increasing Your Income by Outsourcing Content. So you create an account. Define what kind of article you want. Review the article. And rinse and repeat. For more detailed instructions I advise you to watch the video in the beginning of this post so you’ll see how the process works in practice. The more articles you have on your website, the more traffic you can potentially get because you are then ranking under many terms in Google. People will end up to your website by searching many different things. 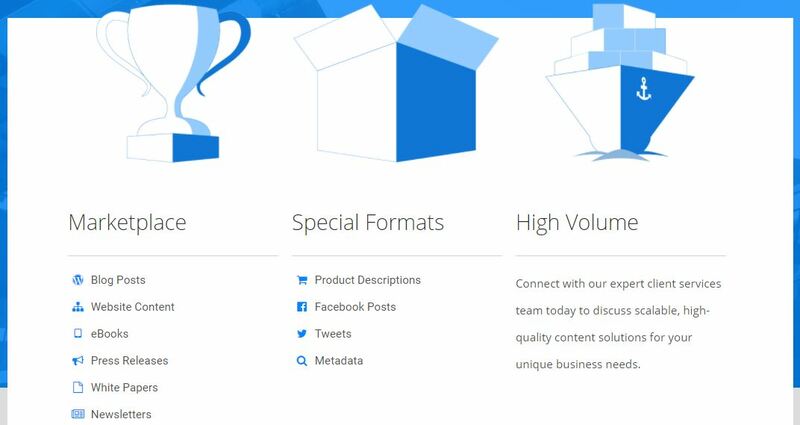 Your articles will also be shared more which adds visitors even more. And as we know, more visitors = more revenue in the long run. If you want to hear more benefits about outsourcing your content, take a look at this article. 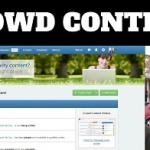 => Try Crowd Content Today! The price of the content is a little bit different for normal website content and Facebook posts/tweets (see the image below). The more advanced writer you want, the more you pay. You can see more details on their website. Overall, the company pays high attention and that their clients are satisfied with the service. The chat box in on the right side of the page on the bottom, as usual. All of these four websites are similar platforms. They sell articles for business owners while freelancers can make money by writing those articles. Which one of them is the best? Where should you buy articles if you need content to your websites? Let me make a few quick comparisons to make your decisions easier. Crowd Content and Textbroker are more expensive ones but they also have a reputation as more high-quality services than iWriter or HireWriters. However, my review of Textbroker reveals that I spent $90 on their articles that drive almost 0 traffic to my website. Therefore, I am probably not going to use their services in the future. iWriter has probably the worst reputation of these four but based on my experience their service is much better than their reputation. I have bought articles for a cheap price that are driving a big amount of traffic to my websites. If I could recommend only one of these services, it would be HireWriters. Their price/quality ratio is great and all of their writers are English native speakers. Still, Crowd Content is also delivering great content. My advice is that you try all of them (except Textbroker) and stick with the one that suits the best for you. How Much Does Crowd Content Pay for Writers? The second rate is so-called “bonus rate” that you can earn if you deliver a quick turnaround time. Some businesses need articles quickly and they are willing to pay more for that. So, let’s take an example that you are a 2-star writer and write a 500-word article. You earn 2,0 cents * 500 = $10. If your rating would be 3 stars, you would earn $22 for the same article. As a 4-star writer you would earn $33 for the article. This example shows how important your star rating really is. The same amount of words but your earnings are 3,3 times bigger if you just deliver high-quality content. Your star rating is based on the last 5 reviews from your clients. Crowd Content doesn’t give you the rating but the client that has ordered an article from you. The client has 72 hours time to accept the article (or ask for refinement). If he doesn’t react during that time, the article gets auto-accepted and you get the money. You’ll get paid every second Friday of each month. You need to have at least $10 in your account to cash out. If you have, for example, $9,7 the money will roll out to the next payment until you have reached the $10 payment limit. Crowd Content has already more than 3,000 writers on their marketplace. Conclusion – Is Crowd Content Legit? Crowd Content is a legitimate company and a service. So far I haven’t heard anything negative about their website or services. Of course, the high price is a drawback compared to some cheaper marketplaces. I have bought the most of my articles from HireWriters because their price/quality ratio has been the best. I can get articles for $8-10 that drive me lots of traffic from Google. On Crowd Content I need to pay usually almost $30 per article. If you are a freelance writer I highly recommend that you consider also “coming to the other side of the table”. As a writer your earnings are always limited to the hours that you spend but as a business owner your income potential is unlimited. You can scale it to huge limits. Wealthy Affiliate provides a step-by-step training that teaches how you can learn to make money online with a blog/website. I can honestly say that their training literally changed my life. Before that I didn’t realize how I could make money with my own blog but it completely opened my eyes. What is your favorite marketplace for making money as a freelance writer or outsourcing your own content creation? Do you prefer building your own online business or work as a freelancer?